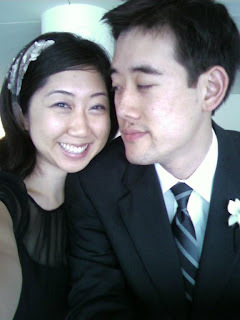 Chris and I went to a wedding in Boston this weekend, it was so much fun! I've never been to Boston before so I was pretty excited. It's a great town! A couple of highlights: taking a short plane ride (usually mine are like 6 hours long since I'm bi-coastal, so to take a 1.5 hour flight was really nice! ); staying at a nice, air-conditioned hotel after being depressed about not being able to find a nice apartment in my price range; seeing a giant, 75-year-old sea turtle at the new england aquarium; going to the JFK presidential library; dancing the night away with Chris (best dance partner ever! ); and seeing two people make a covenant with one another to cherish each other for the rest of their lives ... such a sacred commitment! It was really beautiful. I took some video clips so hopefully, if I get my act together, a boston video will come soon. what a great photo, love it. love you guys. Good to know about this Boston wedding. thanks my friend for these details. I am also very much busy with the preparations of our bohemian inspired wedding. Have been using the ideas from the wedding blogs for entire event planning. Have just booked one of the suitable NYC wedding venues too from an online portal.